You know what you want when it comes to home remodeling; our plumbers, carpenters and electricians know how to make it a reality. We can suggest custom cabinetry from our product line which includes QualityCabinets®, Kraft, Custom Cupboards, and Mid Continent Cabinetry brands. 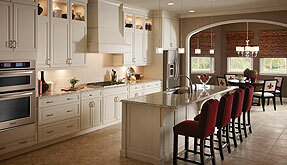 Our granite, marble, engineered stone, solid surface and laminate countertops will add depth and presence to any room. Collaborating with the experts assures your satisfaction with the final product. Our 3D kitchen design system allows you to play an inter-active role in choosing the right look for your kitchen or bathroom. You can view different materials, colors, appliances and fixtures, while comparing and altering designs. This feature is also helpful in giving an accurate estimate of what your dream project will cost. 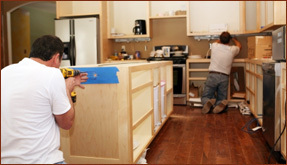 At Kitchens By Hastings we can match you with the proper contractor for all of your plumbing, carpentry or electrcial needs. We offer custom design kitchen and bathroom installation to rehabilitate your living area from top to bottom, giving your home the make over it needs. We have thousands of satisfied customers who have trusted us from start to finish with their plumbing, carpentry and electrical needs. We want you to join their ranks. For all your full scale kitchen and bathroom remodeling jobs, custom storage solutions, home office creation and new construction projects, call Kitchens By Hastings today at 781 233 7171 or stop into our showroom at 36 Broadway, Saugus, Ma.